I wanted to share with you some more of our vacation in Hawaii. We spent the first four nights at the Aulani and while it is a beautiful resort, it is Disney and they sure find creative ways to rip you a new one through your wallet! This is a great place if you have small kids with you, when you have teens there is not much going on for them. Our room was spacious enough for the four of us and it was located on the ground floor with a lanai. The cool thing about a ground floor, we had a gate from the lanai that you stepped out onto the path (with bushes in between) and into the lazy river! This is the entrance/lobby ceiling, very cool and so much detail. This is a Menehune and he is all over the resort. I saw him in quite a few places even in an elevator! I love the lush plants and these lights! We had a few of these birds that hung out on the lanai with us and just sun bathed. One day the girls left the patio door open and forgot to close the screen and one walked into the room. To my surprise, they did not freak out over this, just scooted it out and closed the screen! Too bad I missed this experience! The pools and beach area was nice and we spent our time doing both each day. There wasn’t too many fish in this lagoon but we did go further down to another lagoon and snorkel and it was a blast! I will end with a few of my favorite pictures form the Aulani! Yes, that is Mr. 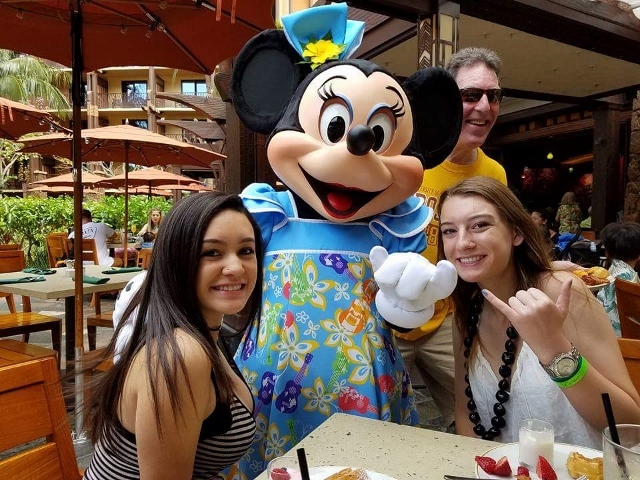 Wonderful photo bombing the girls picture with Minnie Mouse. Stay turned for more of the Hawaiian adventure! Happy Friday everyone and have a wonderful weekend!